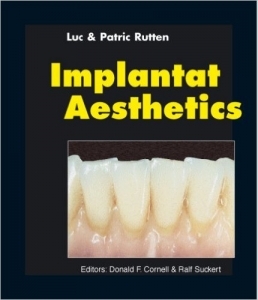 Luc and Patrick Rutten have written some standard works in the domain of aesthetic implantology. As members of several editorial staffs, the Rutten brothers also actively contribute to the publication of trade magazines Dental Dialogue (edition Germany, North America) and Teamwork Media. Technical perfection is no longer the be all and end all of prosthetic dentistry, with the aesthetic aspect becoming increasingly important. To be able to meet today’s high aesthetic expectations, a more intensive interdisciplinary collaboration between dentist and dental technician is required. In strictly technological terms there has been a switch, too, with the Bunsen burner and wax knife being replaced by computers. This opens up a whole new world with lots of possibilities, such as routine manufacturing or designing all-ceramic CADD superstructures. 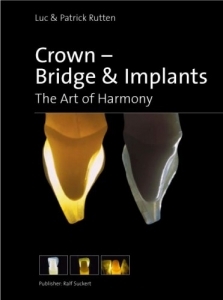 Crown-, Bridge & Implants invites the reader to discover this brave new world using compelling case studies. Crown-, Bridge & Implants is available in German, English, Italian, Korean and Spanish. All chapters and the case studies therein have one thing in common: the solutions they propose adhere to the highest aesthetic demands, whether the initial situation is complex or even hopeless. Which parameters should dentists and dental technicians use when handling implant prosthetic treatments with high functional and aesthetic expectations? How can the most difficult implant positions be hidden successfully? This book explains it all in a step by step, system dependent and interdisciplinary way, with nearly 1,300 colourful illustrations. Additionally, the reader is initiated into the academy of porcelain build-up and the secrets of natural-looking gingiva ceramic. Always to the point, this book does not burden the reader with pure theory, but rather helps him tackle the daily problems at hand right away. As such, it constitutes an exceptional contribution to any ambitious implant prosthesis team. The book “Implant Aesthetics”, published by Ralf Suckert, can be ordered in German, English, Italian and Russian.